Estadio de la Ceramica formerly El Madrigal is a football stadium and home of La Liga side Villarreal CF. Although the stadium only has 22,000 seats, this is half of the population of the city which is testament to the strong local support. In 2005, the stadium was renovated for the clubs entry into Champions League. The Madrigal stadium first opened in 1923 on the 17th June and despite it’s various face lifts it has received over the years, it remains crucially the same home for El Submarino Amarillo (The Yellow Submarine), albeit with larger capacity and more modern facilities. Fans will be quick to point out that Estadio El Madrigal was originally christened as Campo del Villarreal but was renamed just two years later. The first major renovation of the Estadio occurred before the 1952-1953 season when the size of the pitch was expanded to match Olympic regulations of Helsinki games which all clubs aspired to match. The 1960s and 1970s saw the erection of partial roofing which covered the Southern Stand but this turned out to be obsolete, when Villarreal opted to demolish and replace the entire stand for the 1989 season. Similarly, for the club’s 75th anniversary celebration, only a decade later, the South and North stands were rebuilt to form more of an amphitheatre, and supply the club with better match day facilities including family friendly seating, VIP Sectors and the players’ dressing rooms. 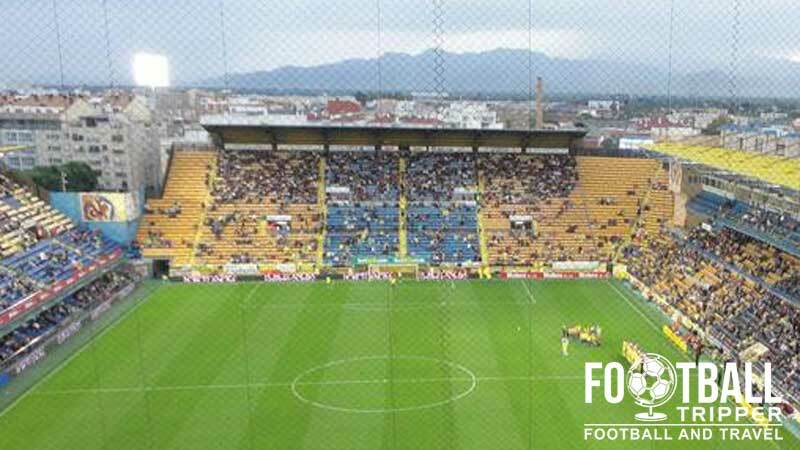 When El Submarino Amarillo made the unprecedented leap into the Champions League in the 2005 season beating Everton in the play-off, regulations required Villarreal to adapt facilities to meet UEFA regulations, and the stadium once again benefited. The renovations resulted in improved external aesthetics, new restaurant options inside the stadium, and better facilities for the home and visiting teams. 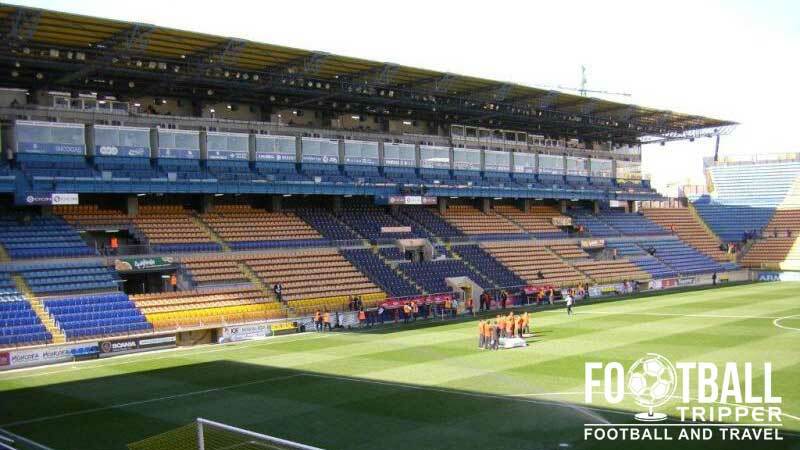 Although the fortunes of Villarreal have dwindled in recent years with relegation to the second division, the club have clawed their way back up into the premier competition and have constructed 30 new VIP boxes as an initiative to increase match day revenues. In addition to this, managers and players will also get the luxury treatment for their backsides with the remodelling of the dugout areas to provide more comfort and visibility. El Madrigal consists of four stands: Fondo Norte, Preferncia (East), Fondo Sur Cubierto and Tribuna (West). Away fans are housed within the highest tier of the Fondo Norte which is a thin strip of steep seating right at the back of the stand. Fully roofed, the views from this section are surprisingly decent, and due to its compact size, when full on a big European night the atmosphere can really be electric. For European matches a minimum of 5% as per UEFA’s guidelines would equate to 1,100. In 2011 Man City reportedly got an allocation of 1,400 whereas Rangers received 3,000 tickets in 2006. As the town of Villarreal isn’t too large you can explore a variety of eating and drinking options before/after the match with the Plaza Mayor where the city hall is being a good starting point. Bars are in an abundant supply such as Casal Del Futbol (Villarreal supporters club) or Restaurant Ca Alex and many serve Tapas which can make for an excellent snack. The cuisine of Villarreal falls broadly under the umbrella of Valencian gastronomy, which has emphasis on sea food due to the natural proximity to the coast. The most famous dish of course being Paella, which is often served with either chicken and rabbit or simply seafood. Villarreal has three main club shops throughout the city as well as an official online store with the one at the stadium predictably the most popular. Located on Calle Blasco Ibáñez, this club shop boasts 150 square meters of Yellow Submarine merchandise and is open for at least 2 hours before kick-off. Saturdays: 10.00 am to 1.30 pm. Some examples of the type of merchandise you can purchase at the club shop. At the stadium there is also an “Outlet” store which sells merchandise from previous seasons at discounted rates. 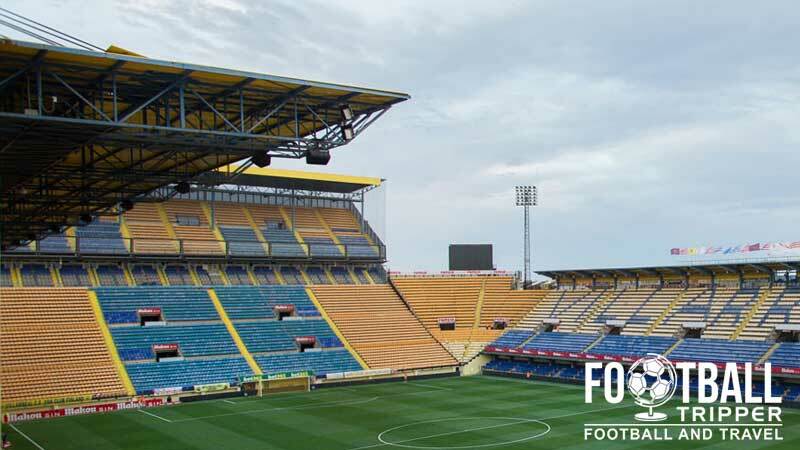 Villarreal FC offer fans the chance to take a fully guided tour of both El Madrigal stadium and the Sports City Complex which is where the club train and has its administrative quarters based. The tour takes Yellow Submarine enthusiasts around the changing rooms, pitch and VIP areas for a truly memorable experience. To book your tour you can either phone the club on 964 500 250 or complete the contact form on the website. 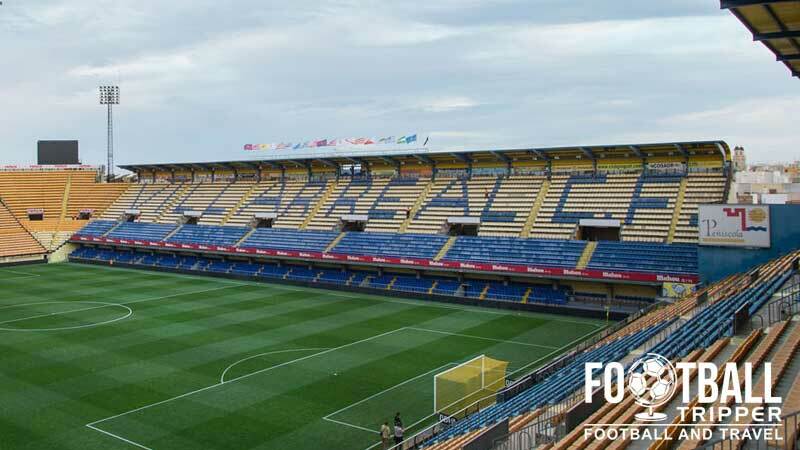 Tickets to see Villarreal can be purchased via the usual methods such as online ([email protected]), by phone (+34 964 524 000) or in person at the ticket offices/club shops listed above. The official website informs fans that you can avoid overcrowding by booking tickets in advance and picking tickets up at Bankia ATM located throughout the city. 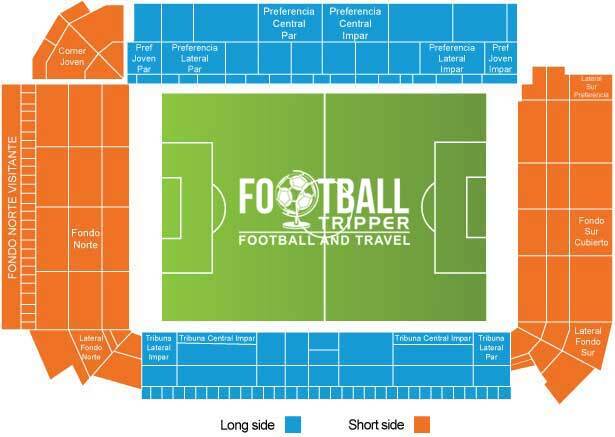 As for ticket prices, as it is end of season we currently can’t compile an expected price range but fan sites suggest that on average you will be paying anywhere between €40.00 to €70.00 for semi-decent seats. Nick Colbourne advises that some of the more expensive seats are exposed to the sunshine, so you may be better off under the shade in the cheaper seats if you haven’t got any sun protection! Based in the province of Castelló, in the greater Valencian region, Estadio el Madrigal is 7km south of Castelló de la Plana which is the province’s capital. Vila-rreal has just 51,367 inhabitants as of 2010, and is the fifteenth largest city in the region of Valencia to give you an idea of how small it is. The main sign of Camp El Madrigal is embedded within the main stand. The stadium is walkable within 20 minutes from the train station as the city is so compact. Driving is a feasible option for a lot of tourists and fans due to the lack of close airports or great public transport options. Unfortunately there’s no official information regarding car parks so you will have to fend for yourself. Remember the city centre is small and you walk to the ground very easily from the other side of town. The train is only feasible if you are coming out of town from say Valencia, which also happens to be the closest airport for those looking to make the trip. Trains from Valencia take you Vila-Real railway station, take 60 minutes and aren’t massively frequent. Once you have arrived, exit onto Calle Estacion outside the train station, which should if you follow it should take you straight into the centre of town. Fans recreating the famous creation by the Beatles, The Yellow Submarine. The nearest airport is Manises in Valencia over 67km which is far from ideal for those looking to make a quick and easy weekend of the football. Once you’ve touched down on Spanish soil, you can either choose to rent a car and drive, or take the train but this will require you to take either a bus or taxi in order to get to the station! There aren’t many locational advantages to be had in such a small city as Villarreal so budget would probably be your main factor when choosing a hotel to stay at. Highly rated options are Hotel Villareal Palace, Vila-Real Marina Azul and Hostal Restaurante La Masia which is pretty affordable.